The Blue Book was among the top three American pulp magazines of the early twentieth century, variously referred to as both "King of the Pulps" and, most recently, "The Slick in Pulp Clothing." It had a lengthy 70-year run under various titles from 1905 to 1975. 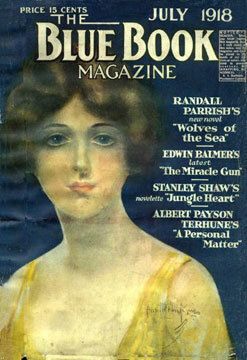 Launched as The Monthly Story Magazine, it was published under that title from May 1905 to August 1906 with a change to The Monthly Story Blue Book Magazine for issues from September 1906 to April 1907. 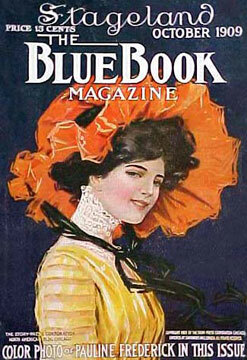 For the next 45 years (May 1907 to January 1952), it was known as The Blue Book Magazine or Blue Book Magazine. 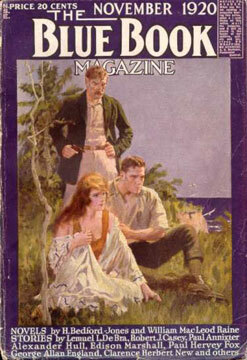 In the late 1930s, it was titled Blue Book of Fiction and Adventure. The title was shortened in February 1952 to Bluebook, continuing until May 1956. With a more exploitative angle, the magazine was revived in October 1960 as Bluebook for Men. The title again became Bluebook for the final run from 1967 to 1975. Ashley, Mike. "Blue Book—The Slick in Pulp Clothing." Pulp Vault, No. 14. Barrington Hills, IL: Tattered Pages Press, 2011: pp. 210-53. Peterson, Theodore. Magazines in the Twentieth Century. Urbana, IL: University of Illinois Press, 1964.